Here is the colour version of last Monday's shot which is seen again below. I remain unconvinced you are showing us Beaver, Mary. I quite like the way you cropped it Mary! Mary MacADNski: No cropping. The colour is SOOC and the BW is a straight conversion. I was going for this compositionally from the beginning. Mary MacADNski: Perhaps in the fall when days are getting shorter my 5:30 rising time will be in dark. I can try then. Right now I go to bed in light and wake up in light. Better in colour I think Mary. Mary MacADNski: When shown two Mondags ago, it seemed popular in BW. Yesterday, most preferred the colour, as probably today, like yourself. I saw it that way with my eyes so can`t fault it. Jolies couleurs, on dirait un tableau de peintre. Mary MacADNski: I am a painter and agree with you completely. I do like this coloured version , quite a mysterious effect with all the reflections. 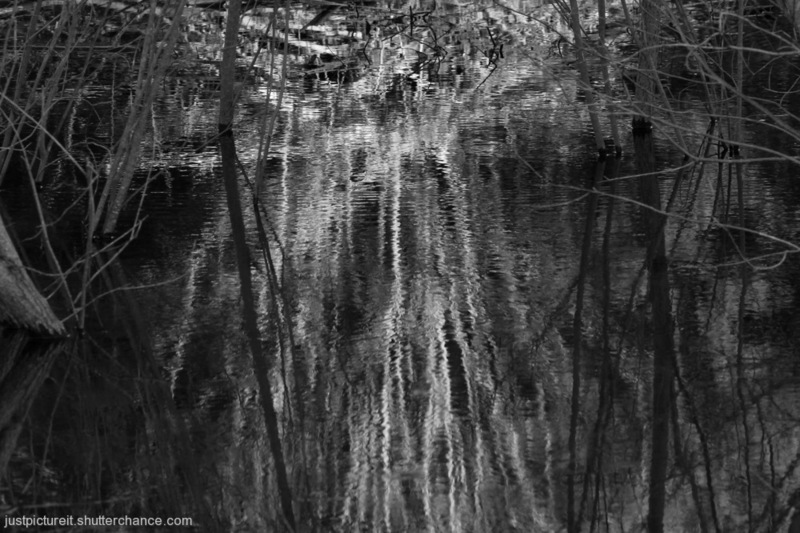 Mary MacADNski: I took mostly abstract shots as it was so stunning to see the reflections that way. I am not doing it justice. I still prefer the B.& W.shot Mary. You are certainly an early riser, 5.30am.seems an unearthly hour to me, as needs must I suppose. Mary MacADNski: I have always risen at this time, a lifelong habit. It is a wonderful time on the planet. Mary MacADNski: It's good to feel, a healthy way to be. Mary MacADNski: I could confess to that too. I prefer the B&W image - the colour seems to confuse rather than emphasise the delicate play of light on the water. Mary MacADNski: Please have a look at yesterday's post.